"The London location was ideal for me in the first instance because I have children, and didn't want to move from my home," she says. "But on top of that, the atmosphere around the campus is wonderful. There are different people from different countries all working and learning together. I quickly made friends from Afghanistan, which stopped me from feeling isolated, but I also made friends from all over the world." The support from the Skills for Learning team at Caxton House also played a big part in helping Awesta and some of her friends to settle in. "The help from the staff there was really great," says Awesta. "For students who spoke English as a second language, their assistance was invaluable in helping people settle in quickly and improve their language skills. The lecturers and technicians were also really supportive and friendly." As part of her studies, Awesta was able to undertake work experience at BBC Worldwide, an experience that she found hugely enjoyable and very useful. "I'd actually undertaken a week's work experience with the BBC back in 2009," she explains. "It was that experience that made me decide I wanted to work as a journalist, so I got back in touch with my old contacts when I was looking for my work placement." 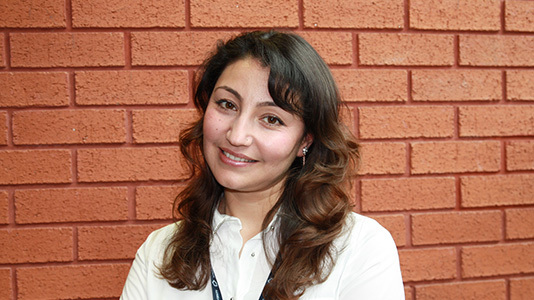 "My first spell had been working in the radio team – I had learned how to present a news bulletin and worked hard on my pronunciation when speaking both Dari and Pashto," says Awesta. "My second placement with the BBC showed just how important it is to study a multimedia journalism degree like LSBU's. This time, I was working on the BBC Worldwide website, translating and correcting copy for the 'Afghan Stream' department." Awesta's other duties also included compiling photo galleries, selecting news clippings, and reading and recording news items. "I was also able to spend a day shadowing a radio presenter, which gave me a great insight into the daily challenges that must be overcome," she says. "It has certainly reinforced my desire to move into journalism and working for the BBC or a similar organisation. I'd like to work for a media outlet that can serve the Afhan people, as I speak both languages and I think it is an audience that needs to see more female presenters too." It is something that Awesta clearly feels passionately about, as she also gave up time during her degree to volunteer for the Afghanistan and Central Asia association, where she worked as a media co-ordinator. "I wrote and translated work for the website, using a content management system," she says. "I really enjoyed it because yet again, it was an opportunity to put what I was learning as part of my degree into practice. In fact, that is one of the things that I treasure most about my degree at LSBU – it was never just about learning the theory but everything was about how to apply it in real situations. It's given me a strong skillset as a journalist able to work across a number of different types of media, and I'm looking forward to getting started in my career."